From my new favorite cookbook - The America’s Test Kitchen Healthy Family Cookbook. 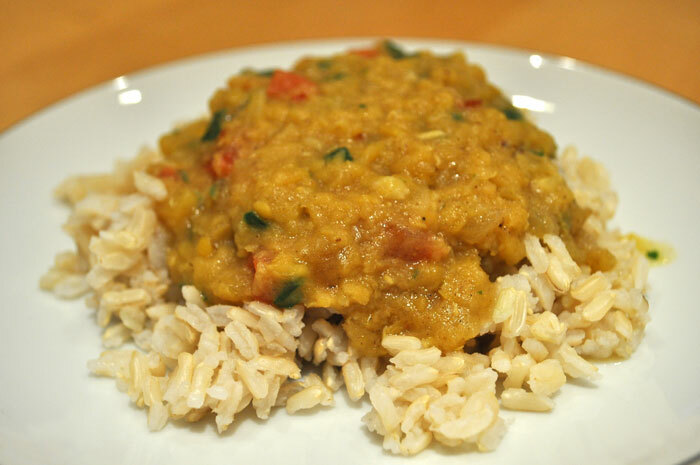 Make sure you use red lentils – brown lentils will not break down enough. Serve over rice with a lemon wedge. Heat oil in a large saucepan over medium heat. Add the spice mixture and cook until fragrant, about 10 seconds. Stir in the onion and cook until softened, 5 to 7 minutes. Stir in the garlic and ginger and cook until fragrant, about 30 seconds. Stir in the water and lentils and bring to a simmer. Reduce the heat to low and continue to simmer until the lentils are tender and resemble a thick, coarse puree, 20 to 25 minutes.